To be clear, this question is subtly different than, “Is this a well shot photo?” And maybe sometimes they are really the same question. The confusion that is inherit with human communication, I suppose. Looking for acceptance of your artwork from others is a natural tendency. More so when you revere someone as knowledgeable in the art-form you are pursuing. To this point I wanted to give some pointed advice: Shoot photos for yourself. While some photographers have commercial reasons for shooting what they do, and others have high aspirations while seeking critical acclaim, most of us are shooting because we love it. (Sometimes shooting is a mix of all three.) That is why I say shoot for yourself. Don't worry what ‘important' photographers, or anyone else, think of your photos if you truly enjoy both shooting and viewing your shots. I know our egos like to hear praise and will often seek it at high costs. I'm telling you if you can turn down the microphone on your ego for just a while, you will get more enjoyment out of the art. Alongside the enjoyment of the art there is the natural human tendency to want to improve. The trick is to make sure you are asking the right question, or, more precisely, the question for the right reason. For those just starting out, and even for those who have been at it longer, I want to offer some alternatives to the, “Do you like it?” question that will hopefully turn it around and help you improve your art form (if that is indeed what you are asking). Again, you are asking for something specific. If the person is knowledgeable they can tell you, “Your focus needs to be further back because the depth of field is not allowing for sharp mountains. Or you might try increasing your aperture if it was only f/2.8.” If they aren't knowledgeable they will likely fall back on, “I don't like it,” and that gets you both nowhere. Perhaps you are seeing the pattern now. Be specific about what feedback you are looking for. People often give more lucid answers when the topic is narrow rather than broad. “Do you like my photo?” is too wide open for most people. They may like a number of aspects of your photo, but overall the subject isn't their cup of tea, so they give you a negative answer when there was valuable feedback they could have given on bringing out shadow detail or increasing saturation in the sky. All of these questions, and more, are pointed at your desire to improve according to your standards of what is good. Photography is an art. If people are telling you they don't like your work and are unwilling to help you improve, ignore them. They aren't worth your time talking to. The most important person to ask the question, “Do you like it?” is yourself. 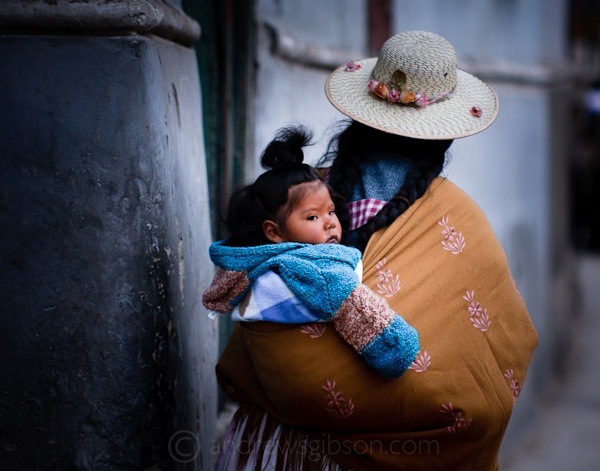 Post from: Digital Photography School's Photography Tips. 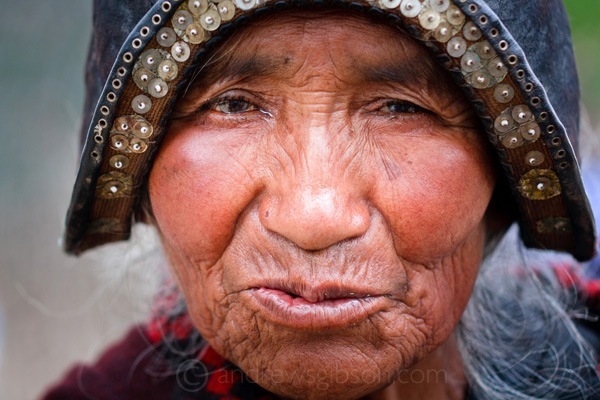 Check out our resources on Portrait Photography Tips, Travel Photography Tips and Understanding Digital Cameras. Describe your photography in 100 words or less. While style is often found in the rear view mirror, I know that my long-time fascination with color and light, two fundamental aspects of painting and photography, weave their way into what may be descriptive of my work. I’m constantly intrigued by the influence of one upon the other. However, I try to be flexible, as a stock photographer, I shoot a diverse range of material because a strong style for one situation may not be desirable for another. When wildlife is in the makeup, I like to portray it contextualized within its landscape and environment. What gear/software do you use? I shoot exclusively digital, having happily left the world of film long ago. I use Canon's EOS 1 series cameras with a 5D Mark II thrown in for a lightweight hiking/landscape body. The 1D cameras are more weight than I care for, but their rugged construct lets me be equally rugged with them, often in remote locations. My lens selection spans the complete range from fish-eye to 500mm. And when wildlife is in the equation, I don't leave home without that 500. Canon's image stabilization has opened up liberties and flexibility otherwise not known to handling big glass without a tripod. 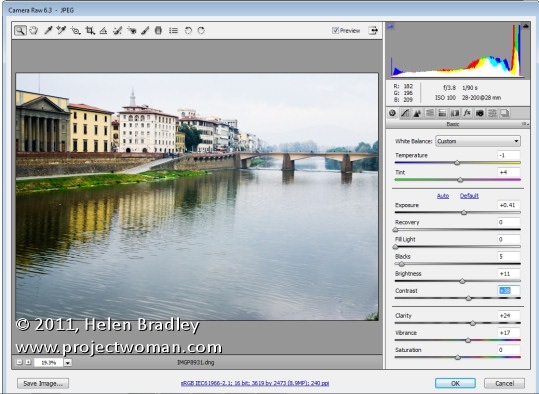 For software, I've migrated along the path of digital asset management software development over the years and have settled with Lightroom for image processing and database management. I rarely use Photoshop anymore, save for more creative alterations and panorama stitches. What’s one quick tip that you’d give people interested in Wildlife photography. Good, consistent wildlife photography is rarely the child of serendipity. Therefore, there is no substitute for spending time in the field, and being knowledgeable about your subject. Get informed and get out there; once you are there, be persistent and patient. What 3 Photography Sites or Photoblogs do you Recommend? 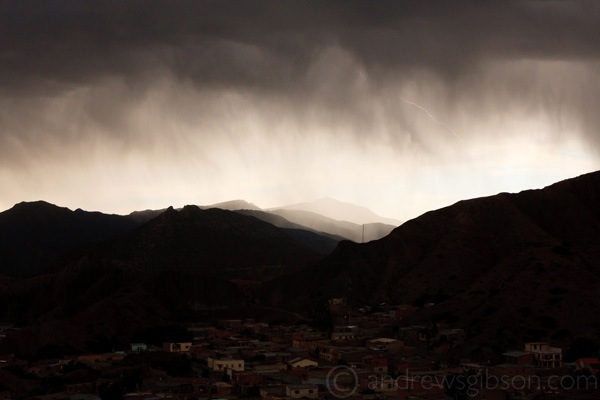 I don't read prolifically on the subject of photography. I've found more personal inspiration through the reading of other subjects, which I feel broadens my perspective and view of the world in which I roam. However, over the years I've found inspiration and information from the following. If you work in Lightroom, at some stage you’ll probably want to take an image to Photoshop for some additional processing. How you send it to Photoshop will have an impact on the options available to you. One option in Lightroom is to take an image to Photoshop as a Smart Object and that has some advantages. Here’s how to do it and why you might consider using this feature. 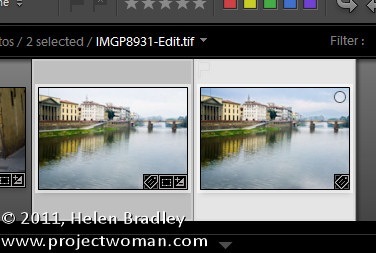 In Lightroom, when you’ve finished processing the image and you’re ready to head to Photoshop, right click the image and choose Edit in > Open as Smart Object in Photoshop (this is available if you’re using Photoshop CS5, CS4 or CS3 – Smart Objects weren’t available in earlier versions of Photoshop). 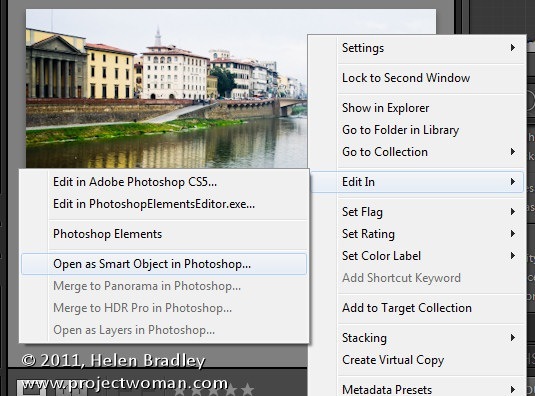 Photoshop will open with your image open on the screen. If you look at the Layers palette you’ll see the layer has an icon in the bottom right corner of its thumbnail. This tells you the image is a Smart Object. If you want to make further adjustments to the image you don’t have to start over. 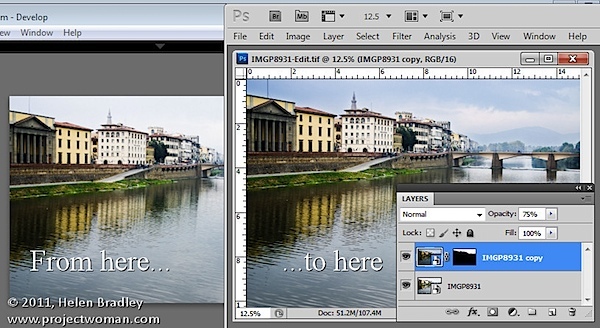 Instead, double click the image thumbnail in the Layers palette and the image will open in Adobe Camera RAW (ACR). The processing options in ACR are the same as you have in Lightroom so you can change how the image is processed. When you are done making changes, click Ok. 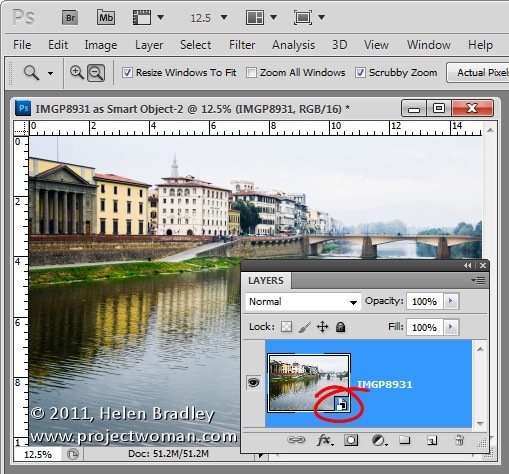 The changes to the image will appear in the Smart Object back in Photoshop. 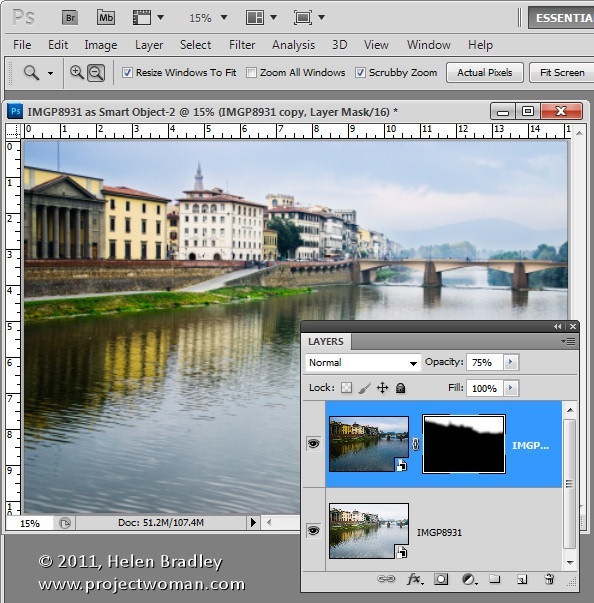 The obvious advantage of opening an image in Photoshop as a Smart Object is being able to make changes to the image even after it has been brought into Photoshop and even after you have made changes to it – such as adding an Adjustment Layer, for example. 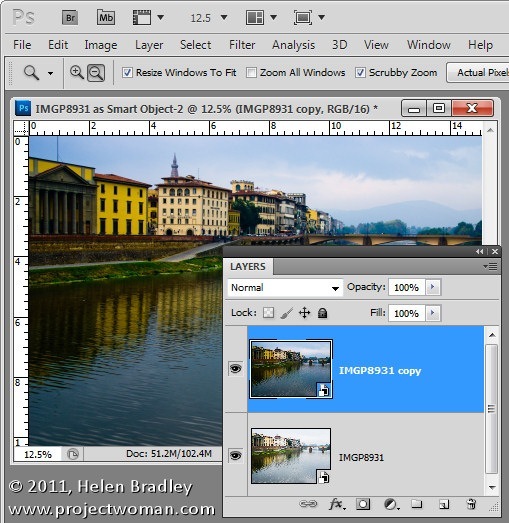 In addition you can use this feature to process an image in more than one way and to blend the two versions together. 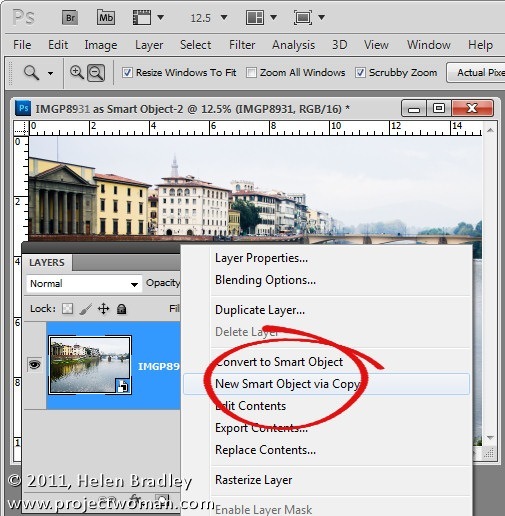 To do this, right click on the smart object layer and choose New Smart Object via Copy. This creates a copy of the smart object layer. Double click on the thumbnail of this second Smart Object to open it in ACR and now process it a second time to bring out detail in another part of the image. In this case I adjusted to get a better sky. When you’re done click Ok to return to Photoshop. The changes have been applied to only the second copy of the image and not the first so there is a different version of the image in each layer. To blend the two layers together add a Layer Mask to the topmost layer – to do this, select the layer and click the Add Layer Mask icon at the foot of the Layers palette. Target the mask by clicking its thumbnail in the Layers palette and paint on the image with black to bring back detail in the layer below. If any of the layers still needs fine tuning, return it to ACR to fix it. Because the two versions of the image are on separate layers you can blend those two layers together using a blend mode or adjust the Opacity of the top layer. When you are done, click Save to save the file, close it and return to Lightroom. 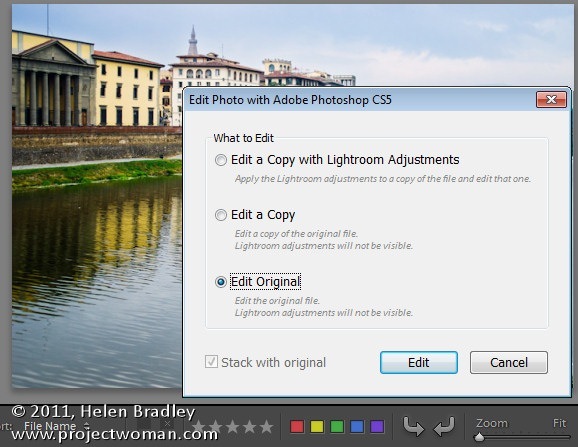 Your edited version of the image will be saved in the same location as the original image and will appear in Lightroom too. If you want to edit this image again at a later date and have the Smart Objects still in place, when you right click the image and choose Edit In > Adobe Photoshop CS5 (or CS4 or CS3), choose Edit Original. Taking your images to Photoshop as Smart Objects gives you additional tools for working with your images in Photoshop – it’s a handy technique to add to your Lightroom/Photoshop toolkit. We finished up our Landscapes (Foregrounds) assignment this week as we challenged you to shoot a landscape photo where the foreground had something of interest in it. Often times we shoot landscapes where we see a gorgeous background, but there's nothing in the foreground to draw us into the rest of the image. Our winners this week were able to do just that and make us want to look further into the image. Our winner this week was rosserx's “Quarters Only”. This shot has a really strong composition, and there's even a bit of humour in there with the “turn vision to clear” sticker. This one really stood out. 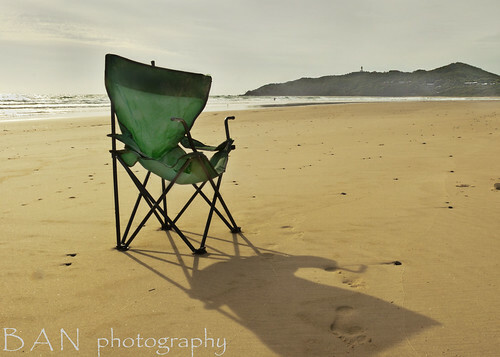 Our first runner up was Bruce A's “Byron Beach Chair”. The strong foreground colour provides a good balance to the more muted tones in the background and the chair helps to provide a sense of scale. It really makes you wonder why the chair is sitting there in the first place, and the footsteps leading away are a nice touch. And last, but not least was Big Nick's “Two Girls”. Often times we see sunsets, but there is little aside from the gorgeous colours and shapes of the clouds. 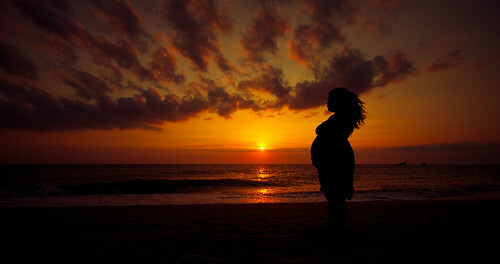 This shot added a more human element to it with the silhouette of an expectant mother. We also started our Framing assignment this week. This is another of our back to basics assignments. Framing can be used to draw attention to a particular subject. We often do it when we display our pictures, but what about within the picture? 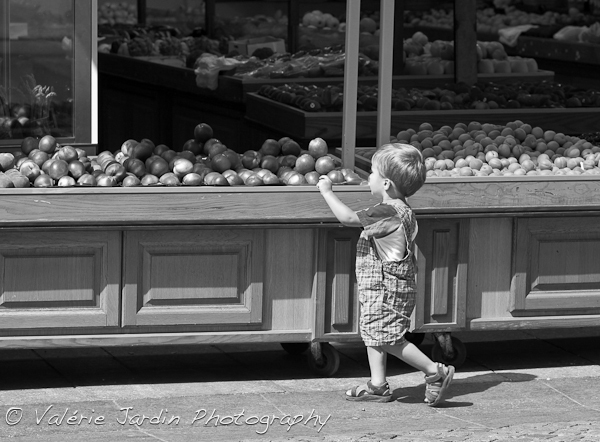 You can use objects within a scene to create a frame to draw your eye to the subject. As always though, a quick reminder of the rules for our weekly assignment. First, your photo must have been taken between 25 May – 8 June 2011. Second, your post must include the word “Framing” and the date the photo was taken. If it is missing either of these it will not be included in the weekly judging. Finally, your EXIF should be intact, and it's useful if you can include some of the main points such as camera, lens, shutter speed, aperture, ISO, etc. Next week our assignment will be Symmetry. Symmetry can add balance and harmony to the composition of an image. You can find it in architecture with matched windows on either side of the door, nature with the petals on flowers, people and the symmetry of faces, or in arrangements of your own making. 1. To acknowledge with respect. 2. A kind mention of a homey. 3. Like when rappers thank people when they make a CD. Okay, so maybe none of this has happened, but I have been derelict in my Saturday Shouting duties as of late. I'll break my silence today with a special Shout Out to Paul Marcellini down in Florida. Paul's got some awesome photos from a state that is difficult to shoot. Almost impossible to shoot, I should say. With the highest point in Florida being a measly 345 feet, there's not much but swamp, water, beach, and more swamp to photograph. Yet Paul has done a heck of a job making swamp look beautiful, and for that he deserves mad props. Keep up the good work Paul, and remember—if the log you are photographing suddenly starts to move, it's probably a gator about to chomp off your arm. Just make sure it isn't the arm holding your camera. This week your challenge is to take and share a photo on the theme of ‘After Dark'. Once you've taken your ‘After Dark' Images – choose your best 1-2, upload them to your favourite photo sharing site and either share a link to them or – embed them in the comments using the our new tool to do so. If you tag your photos on Flickr, Instagram, Twitter or other sites with Tagging tag them as #DPSNIGHT to help others find them. Linking back to this page might also help others know what you're doing so that they can share in the fun. Also – don't forget to check out some of the great shots posted in last weeks Treasures challenge. I am by no means an expert but I know a thing or two about photography. I make a living as a photographer and I work on personal projects all the time. I could not stress enough the importance of personal projects, photo walks, hanging out with other photographers and sharing your work, etc… But this was the subject of another recent article. Photographers have different visions. Some of us are more interested in details while others have wide angle vision. I am definitely in the first category. I am much more interested in details, I rarely shoot an entire building but I concentrate on details such as door knobs, peeling paint, textures, etc. No matter what your style is, when you are out on a photo walk, there will be ‘triggers’ around you that will stir an emotion and prompt you to click the shutter. The most common ‘trigger’ will be the light falling on an object or a scene. It will catch your eye and you’ll want to capture it with your camera. More often than not the result will be disappointing because your camera will not always be able to render the scene the way your eyes experience it. The moment is often so fleeting that you won’t have time to make the necessary adjustments to get the best picture possible. That’s okay, keep trying. Sometimes the best shot are the so called ‘dumb luck’ shots. Don’t spend too much time fumbling with your gear, just shoot! Colors are another common trigger. Your eye will be drawn to contrasting colors. A person in a bright outfit, a red door, rust on a surface. Follow your eye, take your time to absorb the scene, move to shoot it from different angles. Lines and patterns are another obvious draw in photography. I see them all the time. It can be a roadway, railroad tracks, a power line, a set of stairs or a simple railing. Lines and repeating patterns will draw your attention and can make interesting images. Line and patterns can make interesting images. People! 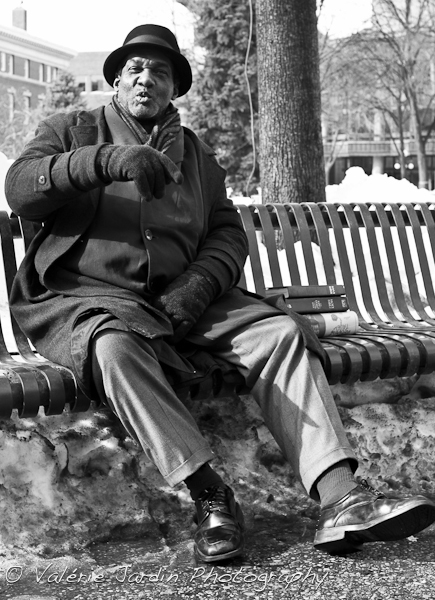 When I am out in the streets shooting, my favorite subjects are everyday people. Be patient and observe the world around you. There are at least two different approaches to people photography: the candids and the street portraits. Combine both and you tell a story. I used to only shoot from a distance with the telephoto lens and I love those images. Find a great location. A street corner with some interesting backdrop (it can be a colorful wall, an amusing billboard, a spot with some interesting lighting, etc) and just wait for the scene to take place. If you are patient enough you will go home with a treasure! Candid street photography often means finding the stage and waiting for the action to take place. I recently started interacting with people in the streets and asking them if I could take their picture, it’s very intimidating but also addicting. Yes, you will get some rejections but a smile can go a long way. Be honest, people like a compliment and most don’t mind having their picture taken. Be friendly and respectful: “Cool outfit, I love it! Would you mind if I took your picture?” Show them the resulting image on the back of your camera, offer a business card, they may want a copy later. I know I would! Street performers are also great subjects to photograph and they usually love the attention, don’t be shy! Street portraits. Starting a conversation with strangers and asking if you can make a portrait can be intimidating but also very rewarding. This gentleman was enjoying a 'warm' February day. He had a stack of bibles next to him which caught my attention. We talked for 15 minutes (I mostly listened) and it made his day! 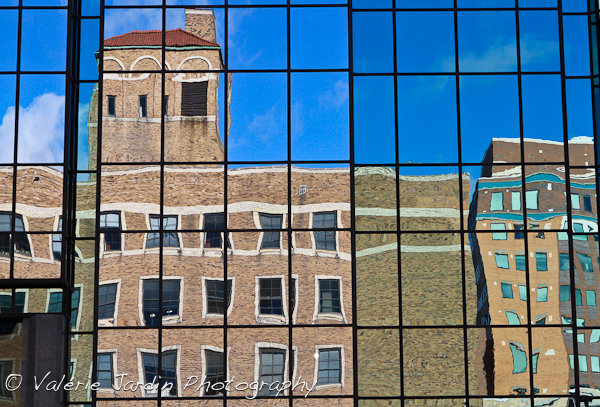 Reflections are another one of my favorite things to look for when out on a photo walk in an urban environment. I love shooting contrasting architectures or elements such as an old buildings or trees reflecting in a modern glass structure. Reflections are everywhere around you when you walk in a city. Collections of things are great to look for and photograph. They are really easy to find at markets. Items that are stacked, fruits and vegetable displayed in neat rows can make great subject! 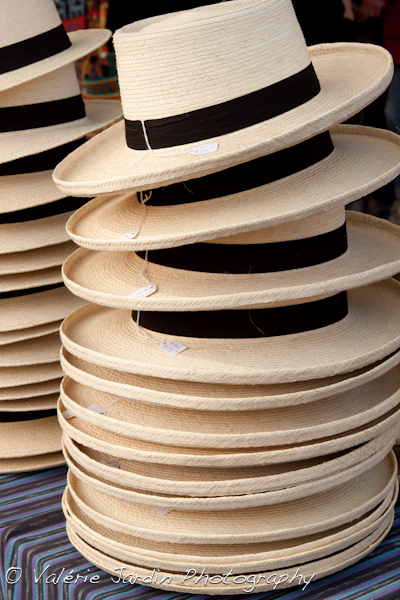 Market days offer many opportunities. I particularly enjoy photographing collections of things. 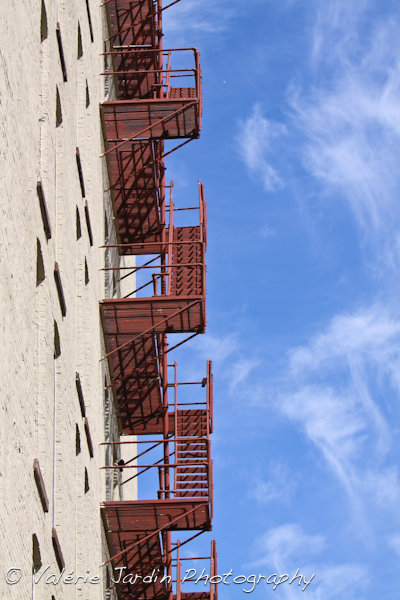 The list could go on and on and I would love to hear about the things you look for when out on a city photo walk. One thing to remember: Just get out and shoot! One camera, one lens and HAVE FUN! At the tail end of my recent two week Lake Superior tour, I decided to go after a shot I had been planning for quite some time. Although I had a long two day drive back home ahead of me, and I was exhausted after two weeks of shooting, driving, hiking, and kayaking, I nonetheless decided to get up at 4am and hike in the dark to Spray Falls, which plunge over the colored cliffs of Pictured Rocks National Lakeshore into Lake Superior's deep waters. Two years prior I had kayaked out to the falls in an attempt to photograph them from below, but couldn't find a safe place to land my kayak near enough to the falls (the cliffs come straight down to the water and keep going, offering no place to stand, let along set up a tripod and camera). This time, I decided to try to find a good vantage point from above, from the beautiful North Country National Scenic Trail which follows along the lake shore. After determining that the sun was rising sufficiently far north this time of year to illuminate the falls at first light, I decided to be there in time for sunrise. I got up early and drove to the trailhead, quickly assembling my gear for the hike. I turned on my headlamp, only to realize the batteries were near dead. No worries, that's why I always carry a spare. I took out my second headlamp, which as it turned out needed new batteries as well. I had just enough power left to light my way for a little while, and since I new that it would be getting brighter as morning twilight set in, I wasn't worried about getting stranded in the dark. So off I went, navigating the trail by the faint light of my headlamp, maintaining a steady pace as I hiked the first mile or so to reach the lake shore. Soon, I could hear the crashing of waves, growing steadily stronger as I got closer and closer. Once I reached the cliffs overlooking Lake Superior, I made a left turn and followed the North Country Trail for two or three miles to reach the falls. Along the way, the light of dawn began to glimmer. I picked up my pace as I realized that the falls were father away than I had estimated, intent on reaching them for first light. I passed several nice compositions, all tempting me to stop, but I stayed my course. I really wanted to get a good shot of the falls! I finally got there, just in time for sunrise, only to wish that I had stopped somewhere else to shoot. I couldn't find a good angle to photograph the falls, and I ended up getting something that, frankly, I would be embarrassed to ever see in print. It was a complete waste of a morning. I had been blinded by my own pre-visualization. I had missed the chance to photograph several lovely scenes in great light, just because I was chasing a chimera that was conjured up in my own mind. I had failed to heed the call of the landscape around me, seduced instead by the Siren lure of my own imagination. It's a lesson I have learned before, and will likely learn over and over again. 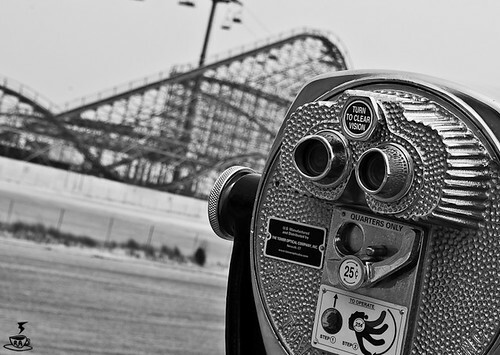 It's hard to know when to pursue your vision, and when to let go and focus on what is actually around you. Lucky for me, as it turns out, it wasn't a waste of a morning at all. I actually thoroughly enjoyed the hike, reveling in the solitude and the crisp spring air. And then I came upon this wonderful patch of large-flowered trillium, cascading down a sloping hillside, backlit by the still rising sun. My pre-visualization blinders were finally off, and I set about working the scene at hand. I choose an ultra-wide angle lens for this shot, zooming out to 14mm so that I could include as many flowers and as much of the brightly lit spring trees in the background as possible. After carefully exploring the area (trying my best to avoid stomping any flowers), I found a particularly thick patch of trillium. Getting in very close to some of the showy blossoms in the foreground—I was only a few inches away—I stopped down to f/22 to ensure sufficient depth-of-field throughout the image. I used a polarizer filter to remove glare from the waxy leaves and intensify the colors. Shading the lens carefully from flare from the sun, I then waited for the slight breeze to calm before triggering the shutter. Backlighting often makes for tricky exposures, but the sun was still low in the sky, reducing the contrast in the scene sufficiently so that the sensor could capture the range of tones from light to dark in one image. The low angle of the sun and the backlighting also meant that the trillium and the forest canopy were alive with bold spring colors. Despite the cold temperatures (it had dropped below freezing at night), I soon found myself in a cloud of biting mosquitoes. I let them feast for awhile—now that I had found my shot, I wasn't going to give it up until I got what I wanted—but when I was done I beat a hasty retreat, and began my long drive home. So, I guess it was a good morning after all—for both me and the mosquitoes! Technical details: Canon 5D Mark II camera, 14-24mm lens (@14mm), polarizer filter, ISO 400, f/22, 1/10 second, about a pint of blood ”donated” to the mosquitoes. The question I'm getting the most since diving into the 5D world has been about “that infamous focusing issue”. I don't think it would have been so infamous if the 7D hadn't come out with such kickass focusing but now that everyone knows the possibilities, there seems to be a resounding sigh of disappointment with those in my situation: a 7D user upgrading (or downgrading?) to a full frame 5DmkII. So here's my experience so far. 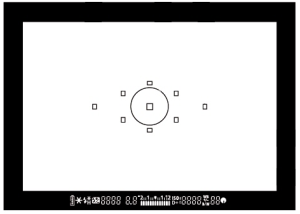 The 7D has 19 focus points and the 5DmkII has 9. I manually select my focus point which means that I compose my shot and then select the focus point (takes just a split second). Which is awesome on the 7D because there's always a focus point right where I want it. On the 5DmkII, this isn't always the case so often, I need to recompose. Which also only takes a split second and doesn't make or break the shot, but still leaves me feeling frustrated and like my camera isn't in sync with my desires. Makes me feel like I'm not in control, the camera is. But do I pick up the 7D before the 5D simply because of this? No…the full frame lusciousness is enough to let this one glitch go. While I can let the lack of focus points go, the difference that does make me want to throw it at a tree once in a while is the speed at which the 5DmkII focuses. I'd heard it said that the 7D was the choice camera amongst sports photographer because of its 8 fps shooting speed (vs 3 on the 5DmkII) but also, the 7D focuses faster and holds the focus better. Which is really important for me shooting kids. They're fast little people and this often calls for sport-like tactics in grabbing the shot. But even with my posed childrens' portrait sessions, this is often the scenario when using the 5DmkII: I set up the pose, get behind the camera, set the focus point and focus and hold it until the exact perfect moment to release the shutter. The moment the laugh naturally happens or their eyes tell me “GO!” On the 7D, this is no problemo. On the 5D, the focus takes longer to achieve and then ‘falls off' the instant there's a little head movement, hand movement…and then I'm right back to grabbing focus which means that the split second when their eyes tell me to hit it could be completely missed. Does this make me want to abandon the full frame at times in favor of my trusty 7D? You betchya. I realize I'm very lucky to have both cameras. I often get readers on my blog or in email asking which they should choose. It's a hard one because the full frame has been life changing (melodramatic? No way…seriously life changing) but after being a 7D user, the 5DmkII has left much to be desired in certain areas. Some readers have even gotten to the point where they've saved up all the pennies they need to take the dive into full frame and want to know my advice. If you can have both, have both! But my official advice is this: I think the 5DmkIII is going to rock the camera world. It's going to be a 7D/5D hybrid. Like a 7D with a full frame sensor. Hold out. As soon as they can be purchased or pre-ordered, do it. I know I will! I've just watched the movie Memoirs of a Geisha. The director went to great lengths of recreate the world of pre-war Japan – the movie is beautifully filmed and successfully evokes the atmosphere of a time and place that no longer exist. It's one thing to do this on the set of a high budget movie, but there are lessons that photographers can learn from the director's approach. You can use the same techniques to create moody, evocative photos of your own. Low light is a constant theme from the opening scenes. Some of the movie is shot indoors. Whether the scene is set during the day or at night, light levels are always low. The rooms are lit by pools of light and detail is obscured by shadows. The director has used low light to create atmosphere. The same applies to photography. Shadows are important – they help define the shape of the subject, they give the image depth and they help create atmosphere because the viewer has to use their imagination to fill in the gaps. There's no need to reveal every detail. In the movie, I don't think there is a single scene shot in brilliant sunshine. When the action goes outside the scenes are filmed in the evening, or on a cloudy day or the late afternoon. If you want to create evocative images, these are the best times to take photos. You'll get your moodiest images when you shoot in all types of low light; including bad weather, the golden hour or during twilight. Parts of the movie are filmed at night. The director makes use of a scenic location (Kyoto in Japan – although much of the movie was shot on purpose built sets) and the atmosphere created by tungsten street lights and lamps. You can do the same yourself in any urban environment. Most towns and cities, especially if the architecture is beautiful, have a wonderful atmosphere at night. If you are going to include the sky in the photo, you should shoot at twilight, when there is still enough daylight to give the sky some colour. Cinematographers use telephoto lenses to get in close to the subject. Using a telephoto lens pulls the background closer to the subject, and they often use a wide aperture to throw the rest of the scene out of focus. You'll see this technique used a lot in movies when the camera focuses on the face of an actor making a speech. These are techniques that you can also use in your photos. Out-of-focus highlights and bokeh are mysterious and create mood. Again, it's because the photographer isn't revealing every detail – and the viewer has to use their imagination. This works best if you have prime lenses, but you can still explore these techniques with a typical zoom kit lens on a crop sensor camera. The long end of the focal range is effectively a short telephoto lens and even with a relatively small maximum aperture of around f4 or f5.6, you can still get a narrow depth-of-field, especially if you move in close enough to fill the frame with someone's face. In Memoirs of a Geisha the director has painstakingly recreated the world that the geishas lived in. A lot of attention has gone into the details that make the recreation convincing, such as the cups the characters drink from, or the wooden shoes worn by the geishas. There are a lot of short clips in the movie that zoom in on these details, such as a scene showing the main character slipping on a pair of traditional wooden shoes as she exits a building. You should look for intimate details like these too. This is a good technique if you're travelling – look for the little things that capture the atmosphere of the place that you're visiting. The way the movie uses colour is enchanting. In fact, it's worth watching the movie to see just how the director used the power of colour. You can then apply these lessons to your own photography. The movie uses colour contrast to create atmosphere. There is a dance scene where the geisha is lit by blue light and there are tungsten lights burning, out of focus, in the foreground. The orange and blue contrast with each other. It's a very powerful, moody effect. You also see the same blue/orange colour contrast in many of the night scenes. There is also a lot of subdued colour in the movie, especially in the indoor scenes. There is a limited colour palette, and it's something that you can learn from. It's tempting, and easy, to use bright colours in photos for impact. It's more difficult to use a limited range of colours, but doing so can help you create mood. For instance, think of a seascape taken at twilight, with mostly blue tones. The colours are limited and this adds to the mood. Some of the scenes in the movie are shot in cold light, and others in warm light. You have a similar control on your camera. It's called white balance and you are probably more familiar with its role in obtaining a neutral colour balance (that's one of the things it's designed to do). This is fine for general purposes, but it doesn't help you create moody images. By taking control of white balance, you can make your images cooler or warmer, depending on the type of mood you are trying to evoke. It's easiest to do when you use the Raw format, as you can experiment with raising or lowering the colour temperature in post-processing to see how it affects the mood of your photo. That's what I did with the two photos above. I processed the first with a colour temperature setting of 4500K in Lightroom. It fits the mood that I felt when I took the photo as it was getting dark. But I also created a warmer version by setting the colour temperature to 5977K. I like both versions – and it just shows what a difference one simple change can make. In this article I've touched on just a few techniques that you can use to create moody photos. I've written an eBook that explores these techniques and more in much greater detail. 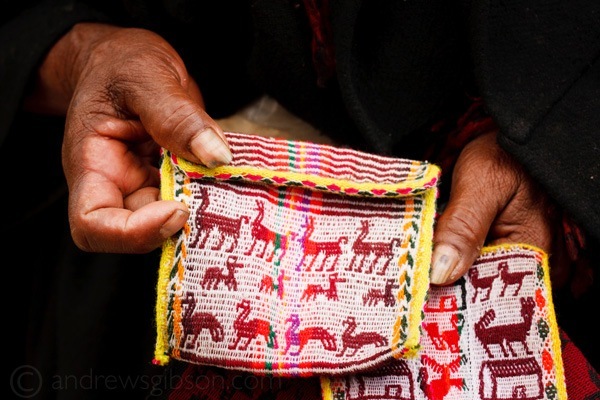 It's called The Evocative Image and it's available from Craft & Vision for just $5US. It's also available as an iPad application – see the Craft & Vision for full details. 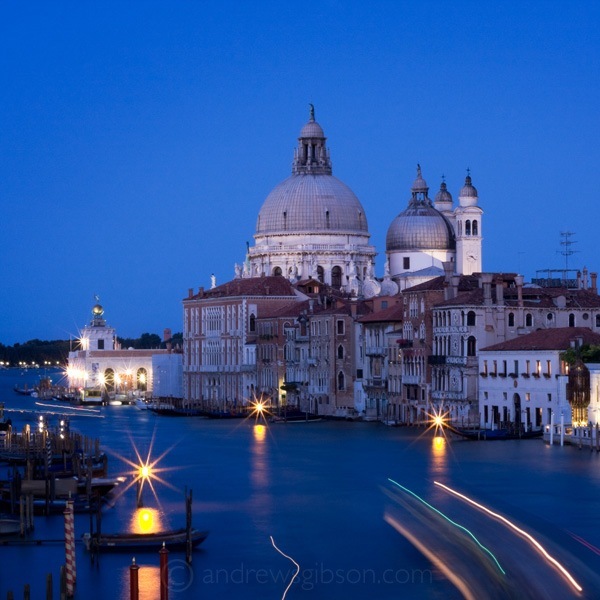 Andrew S Gibson is a freelance writer based in Auckland, New Zealand. He is the Technical Editor of EOS magazine and writes photography eBooks for Craft And Vision. including The Evocative Image.